Yacht Management app designed for yachts, fleets & delivery companies. Build a full history of your yacht/s or delivery operations; Galileo allows you to monitor, evaluate and plan. Clean, intuitive design allowing you to work with Galileo on PC, Mac or Tablets. Yacht Manager is a web app designed to allow you to manage all aspects of your yacht or yachts and the voyages they undertake. Accessible from anywhere there's an internet connection, you simply log in and start managing all your administrative and maintenance functions. The app has been designed by yachting professionals who have first hand knowledge with what it takes to manage yachts both commercially and non-commercially. It provides you with a user-friendly and productive online system to meet the increasing demands brought on by maritime regulations, such as MGN-280, the Large Yacht code and the new IPV code introduced in 2019. 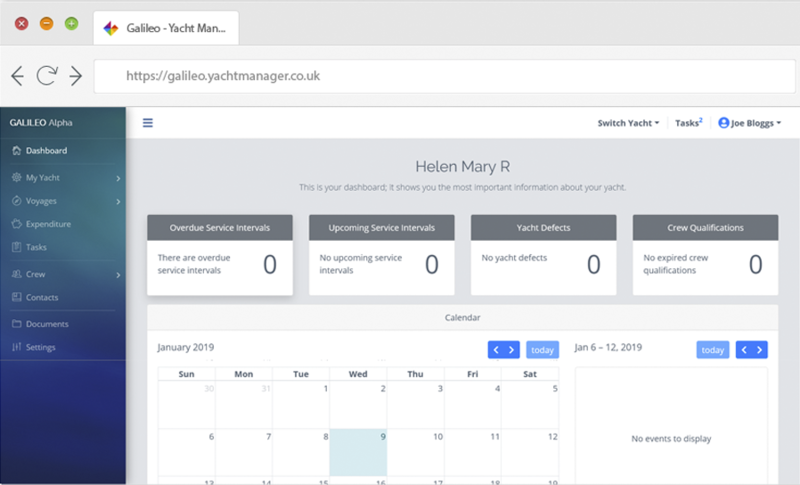 Effectively organise and maintain yacht tasks and defects; voyages, charters or deliveries; planned maintenance; crew management; vendors; systems; inventory and spares; all under one centralised and secure online yacht management system. Galileo provides a means to manage the vessel’s daily tasks, leading to lower long-term operational costs and less crew time spent on administration. Our standard account - complete yacht management solution for a single yacht. Designed for yacht management companies, or owners/masters with multiple vessels. Designed to meet the needs of the new MCA IPV code, manage all aspects of delivery operations. 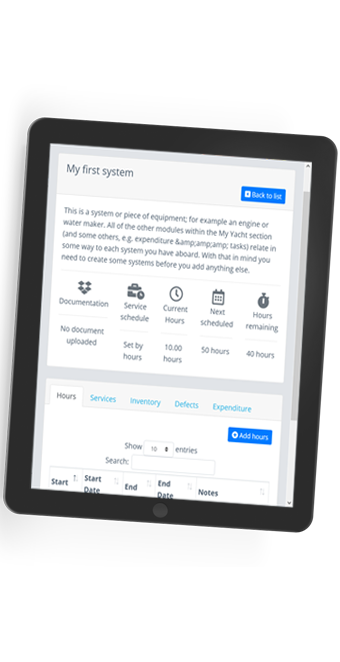 Use the system management module to organise your yacht into logical areas, set service dates, manage inventories, defects and expenditure. View reports and essential data to keep track of your yachts systems. The servicing and maintenance module allows you to set scheduled service dates (or service hours), set & recieve email reminders, record expenditure & record service outcomes. Allocate resources and use items from the inventory and allocate against the service. Manage your inventory couldn't be simpler with the Inventory module; manage stock levels, stock ordering reminders, and preferred supplier for each item. Link the use of items in the inventory to defects and services. Keeping track of your vessels defects & non planned maintenance is crucial to maintain asset value and regulatory compliance. The defect module allows you to record defects, record repairs and outcomes and monitor expenditure. Ensure you meet the requirements of the SOLAS convention & MCA passage planning requirements. Import routes from Navionics & iSailor apps to create passage plans, manage crew lists, charters, and manage APA's for each voyage with the Voyage planning module. Maintain qualification records, next of kin data, and hours of rest for your crew/s. The crew management module's data is encrypted as standard and warns you about GDPR data protection compliance. Upload your important documents and record version information with the Document Repository module. PDF documents can be viewed directly in the browser window along with physical location information with where to find the document aboard your vessel. Keep track of your spending with the Expenditure module. Expenditure can be recorded across most of the other modules allowing you to monitor which aspects of your vessel are costing the most. Allocate expenditure to ledger categories & payment types (card, cash etc). View easy to understand graphs and download expenditure records via CSV, PDF or Print. Galileo is fully responsive, scaling to fit most window sizes, supported browsers are Chrome, Firefox, & Safari on Mac or PC's along with 10" tablets. We charge an annual subscription fee to use our web app, the cost of which is based on your vessels length overall (LOA) or number of vessels delivered. This allows us to scale the subscription based on the theoretical complexity of your vessel and data to be stored. Each account is supplied with 3 users as standard and you can add additional users as necessary for a small fee. Please contact us to discuss your requirements. Request a customised demonstration and discover how you can take your vessel management or delivery company management to the next level.